As a Commercial, Residential and Industrial locksmith firm Arrowhead Lock and Safe Inc. specializes in integrated security platforms while focusing on providing our customers with the highest security products our industry has to offer. 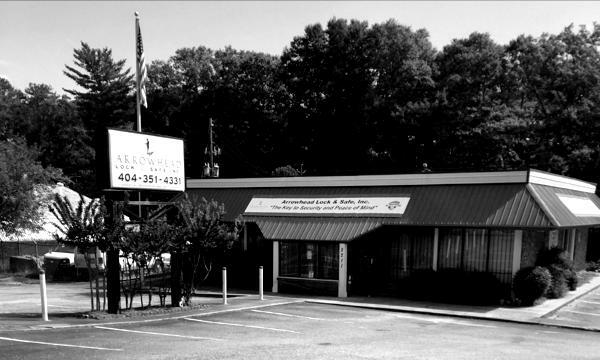 As the Medeco Security Center for Atlanta our office is located on Marietta Blvd. We integrate access control systems into your business or residence and assist our clients in establishing a secure and private atmosphere for their companies and families alike. We supply all major brands of security hardware including Medeco, Arrow, Keymark, Schlage, Kwikset, Baldwin, Mul-T-Lock, and Sargent. We act as a full locksmith service repair center and dealer for all major safe manufacturers such as AMSEC, Gardall, Gun Vault and Fireking. Our office at 2211 Marietta Blvd NW has a full locksmith lock shop that assists customers in re keying, repairing locks, cutting keys and other locksmith services. We provide a free quote and survey services to our clients! Established in 1973 We are a locally owned locksmith and access control company that has been servicing Atlanta’s businesses and residences for 40 years. Since our origination in East Point in the 1970’s we moved our office to Marietta Blvd just off Chattahoochee Ave in the early 90’s where it has been a fixture to the local community for over 20 years. Copyright © 2018 Arrowhead Locksmith Locksmith in Atlanta GA All rights reserved.